The success of dental Implants relies mostly on the quality and quantity of the bone tissue it is anchored to. In some cases, there is not enough bone density in the area to firmly support the implant and a bone graft procedure is needed. Just above the bone tissue of your upper jaw lies the nasal cavity known as sinus cavity. 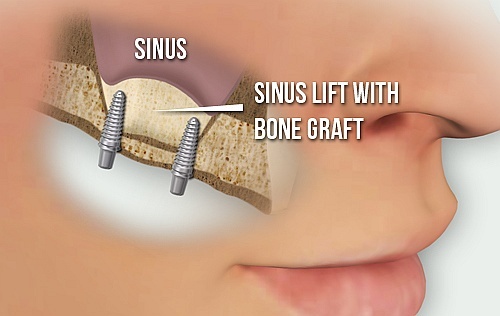 To have enough space for the bone graft we perform a procedure called a sinus lift. There are several techniques used for sinus lift surgeries. The common technique relies on exposing the bone and cutting a small circle in it, then lifting this bone piece into the sinus cavity. The space underneath the bone piece is then filled with bone graft material, which can regenerate lost bone and tissue. The incision is finally closed and left to heal. A time frame of 4 to 12 months, depending on each case, is allowed for the bone to develop and only after, can the implants be placed. Sinus lift procedures are generally painless and can be performed under local anesthesia at Bayview Village Dental Specialists. Dr. Edy Braun will explain the procedure thoroughly and will make sure that you’re comfortable, relaxed and feeling no pain or discomfort all through the procedure.